Melatonin releases from the pineal gland, reaching its peak at night to help maintain tissues in a youthful state of health. Secretion of melatonin declines significantly with age, as the pineal gland becomes calcified. 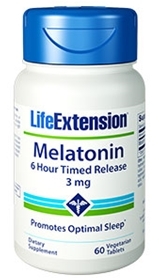 Melatonin keeps our circadian cycle in tune as it communicates with the body’s cells. Not only does this hormone work to maintain cell health, it appears to regulate a system of self-repair and regeneration. When this hard-working hormone is diminished, our biological functions are impaired. This six-hour, timed-release melatonin formulation is especially good for those people who tend to wake too soon. If you can get to sleep, but find that you wake up during the night, timed-release melatonin can help you stay asleep all night long. Other ingredients: sucrose, cornstarch, ethyl cellulose, magnesium stearate, gelatin, water. Contains gluten and corn. This product contains NO milk, egg, fish, peanuts, crustacean shellfish, soybeans, tree nuts, wheat, yeast, or rice. Contains NO artificial sweeteners, rice flavors, colors, or preservatives. Take one capsule 30 to 60 minutes before bedtime, or as recommended by a healthcare practitioner.